Headaches are one of the most frequently occurring ailments, even more so than the common cold. There are many different causes for this type of pain including stress and tension, food and environmental allergies, sinus inflammation, low blood sugar, hormonal imbalance, high blood pressure, constipation, aspartame, and caffeine, among others. According to Chinese theory, a headache can be the result of an invasion of external pathogens (wind, heat, dampness), internal disruptions (excesses, deficiencies, stagnation), or blockages in any of the 7 meridians that meet in the head. Conventional treatment consists of drugs, such as, addictive painkillers, sedatives, vasoconstrictors, and antidepressants. These are associated with a laundry list of side effects and do not target the root cause. The following techniques are all natural and drug free ways to relieve and eliminate a headache. If your headaches or migraines occur regularly, please seek additional medical care from a natural healthcare practitioner. Application: Choose the tenderest side and use your fingertips or knuckles to apply firm pressure to the acupoints for thirty seconds. To stimulate more intensely use slow circular motions, tapping, or rhythmic squeezing. By manipulating the following acupuncture points, you can release endorphins and other natural substances in your body that reduce the pain associated with headaches. 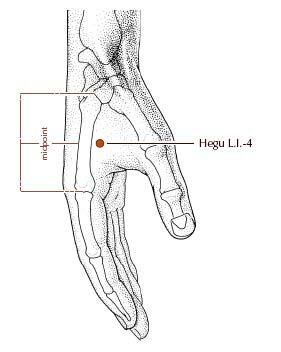 Large Intestine 4 (LI-4): Relieves all types of headaches. 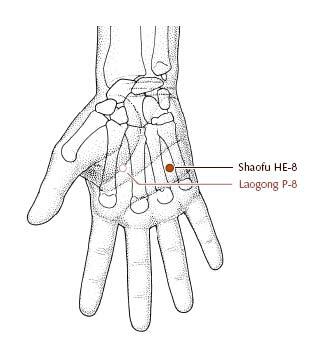 Location: In the muscular portion of the hand between the thumb and first finger. *This point is contraindicated in pregnancy. Gall Bladder 31 (GB-31): Relieves one-sided headaches. 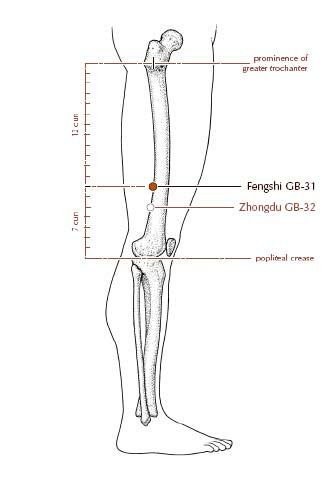 Location: The spot on the midline of the outer thigh, approximately where the tip of the middle finger reaches when the straightened arm is held close to the side. 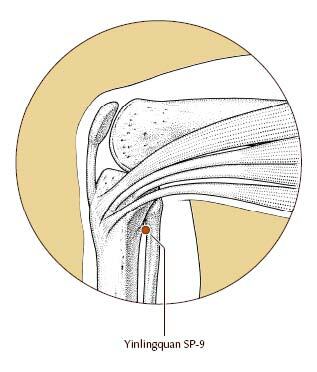 Spleen 9 (SP-9): Relieves frontal headaches Location: The depression located on the mid-line of inner leg just below the knee crease. Heart 8 (HE-8): Relieves Migraine-type headaches. Location: The point where the tip of the little finger touches when the hand is made into a fist. Application: Use a few drops of Lavender and/or Peppermint oil and rub on the temples, between the eyebrows, and on the back of the neck. Use the remaining oil for inhalation by cupping the hands over the nose and mouth and taking slow deep breaths. In addition to easing headaches and migraines, peppermint oil is used in aromatherapy to stimulate the mind, increase mental agility and to increase focus. It is also excellent for cooling the skin, reducing redness and calming irritation and itchiness. Furthermore, it helps for apathy, shock, nervous stress, vertigo and faintness and in general respiratory disorders including dry coughs, sinus congestion, asthma, bronchitis, pneumonia, tuberculosis, to ease spastic colon, and to stimulate the digestive system. It is with good reason why lavender oil is one of the most favorite essential oils; it is calming, relaxing oil, which combats stress and crisis, while excellent for migraines. Apart from that, it supports female health and it is also very beneficial for problems such as bronchitis, asthma, colds, laryngitis, halitosis, throat infections and whooping cough and helps the digestive system deal with colic, nausea, vomiting and flatulence. Lavender oil relieves pain when used for rheumatism, arthritis, lumbago and muscular aches and pains, especially those associated with sport. On the skin, lavender oil tones and revitalizes it and is useful for all types of skin problems such as abscesses, acne, oily skin, boils, burns, sunburn, wounds, psoriasis, lice, insect bites, stings and also acts as an insect repellent. Water is a very soothing and grounding element, and healing agent. By using this technique you are manipulating the circulation of the body, promoting detoxification and stimulating the immune system. By using water as directed below, blood moves from the head to the feet, relieving congestion and pain. Directions: Put your feet in warm water and place ice pack around the neck. Do this 1-2 times daily for 10 minutes. When we are in pain we tend to hold our breath in an attempt to brace ourselves for the unpleasant sensation we are experiencing. Some headaches are made worse by an inadequate supply of oxygen. Try the exercise below to increase oxygen, and use the power of intention to surrender to this or any ailment. • Begin by closing your eyes (or if you prefer, keep your eyes open). Take several slow, deep breaths, exhaling completely after each. • Now see if you can imagine a place where you feel completely comfortable and peaceful. It might be real or imaginary, one from your past, or someplace you’ve always wanted to go (it doesn’t really matter, just so long as this place feels very safe and peaceful to you). • Allow that special place to take shape slowly (there’s no rush). Enjoy the scenery and listen to the sounds of this wonderful place. • Relax and enjoy the peace, comfort and safety of your special place. • Begin to sense that something wonderful is about to happen. Know the sense of certainty. Everything is right, just as it should be. • Now notice a soft glow of golden light from above. It begins to bathe your body. A tingling, shimmering, vibrant energy surrounds you, energizes you, soothes you, and heals you. • This goodness and healing energy seeps into your body, infusing you with a generous, boundless energy and sense of well-being. • Feel it move through the layers of your body, deeper and deeper into each and every organ, down to the bone. • Feel it in each and every cell, dissolving any blockages, correcting any imbalances. Enjoy this free-flowing, healthy energy sweeping through your body. Now you are relaxing; healing. • Your body remembers how to be well, and savors this feeling of well-being. You feel peaceful and easy in your special place – a healing place – one that is always here. You know it’s a place you can visit anytime, and feel this healing energy and peace. When you are ready to return, take a deep breath and exhale fully. Open your eyes and spend a few moments savoring this relaxed, healthy, comfortable feeling. 1. Place all of the pain in a large, strong metal box. Closed, sealed tightly and locked with an enormous, strong padlock. 2. With the TV remote control, slowly turn down the pain volume until you can barely hear it; then it disappears entirely. 3. Imagine that the pain is washed away by a cool, calm river flowing through your entire body. Chamomile, Lemon Balm, Peppermint, Rosemary, Feverfew, Lavender, Skullcap, Dandelion, Passion Flower, Ginkgo Biloba, St Johns worth, Yerba Mate, Winter Green, Lemon Balm, or Valerian Root. Although this method will respond less quickly than others, it is important for the prevention of future occurrences. Magnesium, a mineral which relaxes muscles and reduces anxiety, can be found in foods such as seaweed, beans, whole grains, and nuts. Consuming these foods will also help stabilize your blood glucose levels, which is a common trigger of headaches. Take clove, cinnamon and almond in equal quantities (around 1 teaspoon each) and grind together with a little water to make a paste. Apply paste on the forehead. A paste made of sandalwood powder can also be applied on the forehead. "I visited Danielle DeVivo approx. one year ago with elbow pain, it was both inside and on the outside of the elbow, acute case of tenditis. She was able to give me..."
"Danielle is a very gifted acupuncturist, as well as Chinese herbalist. I have found short-term as well as long-term benefits ..."
"Being tall and over 60 years old, maintaining a strong healthy back is an everyday concern. I am very pleased to say ..."
"I had an acute case of bursitis, very painful like a toothache you can’t rub to get relief. I could barely lift my arm. I tried ..."
"I recently took a fall, and aside from a few cuts I thought I was fine then a few hours later I had a pain in my left side when I took a deep breatht..."
"With your assistance, I had uterine polyps and ovarian cysts disappear, fibroids shrink and an overall gyn condition significantly improve..."
Serving Saratoga Springs, Ballston Spa, Glens Falls. © 2006 - 2018 SaratogaSpringsAcupuncture.com - All rights reserved. No content on this site may be reused in any fashion without written permission from SaratogaSpringsAcupuncture.com.